Chicago Botanical Gardens has always been one of my favorite places to visit. 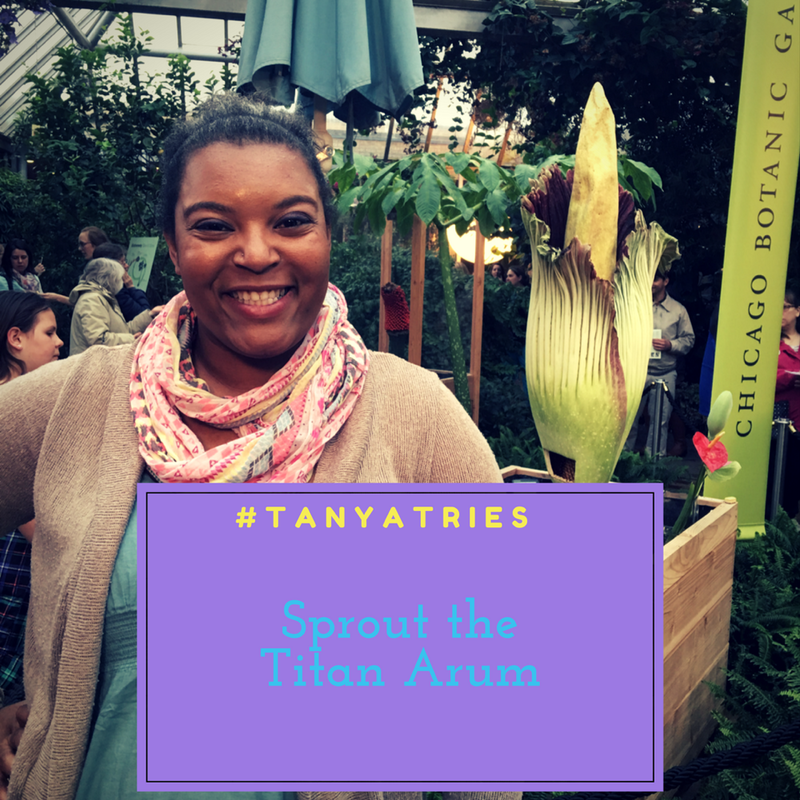 When I heard there was going to be another Titan Arum aka a Corpse flower blooming in the gardens, I had to go see it. Here is some background about the plant that had me falling in love with it at first smell. 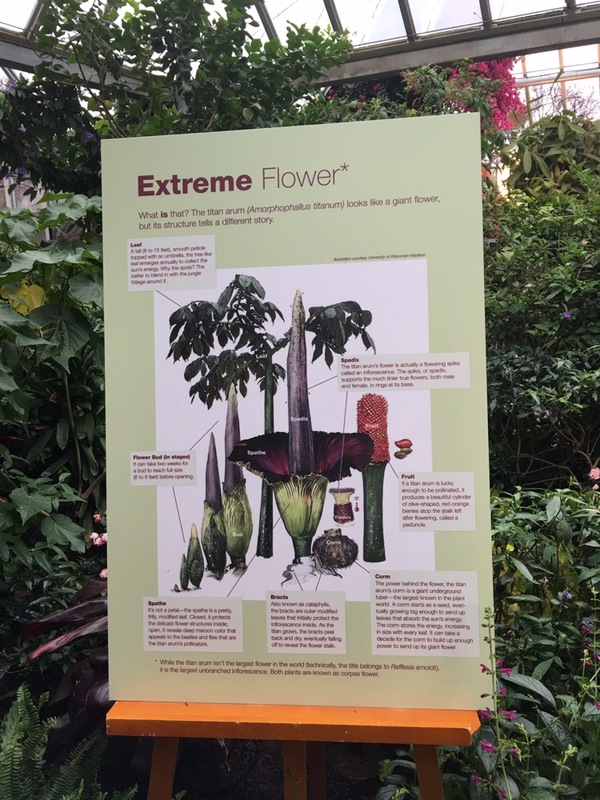 Chicago Botanic Gardens describes the Corpse flower as “a 6- to 8-foot-tall flower, but it’s actually a tall spadix (flower structure) wrapped by a spathe (a frilly modified leaf). Technically the largest unbranched inflorescence in the world, the titan arum also sends up tall, umbrella-like, individual leaves that can reach 15 feet and look like small trees.” Another awesome fact is that it blooms once every 10 years. When word hits the street that one is in bloom, the media and paparazzi come out to document this rare appearance. It even has its own live stream, for those who cannot see it in person. 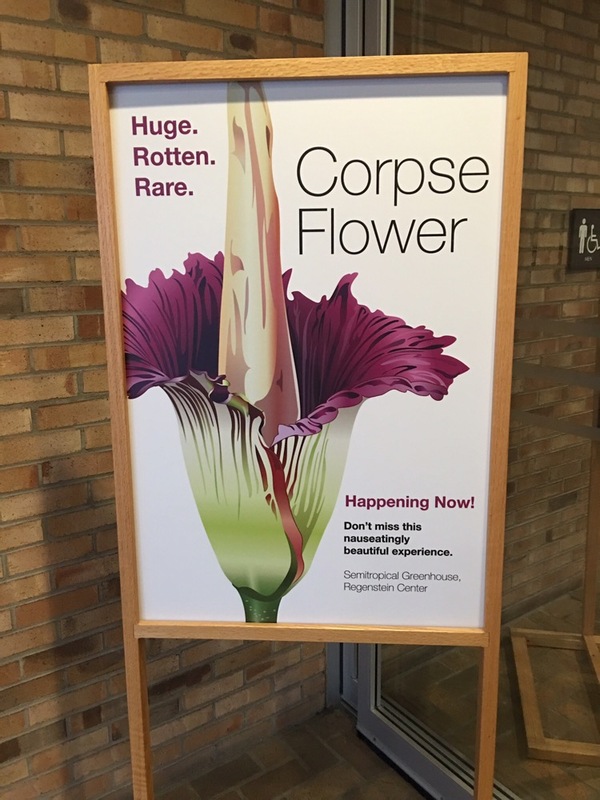 If you do not go in person, you will miss out on the reason why this is known as a Corpse Flower. It does really smell awful, but it is great at the same time. The smell is at its worst, which is it’s best at full bloom and a few hours after. The rest of the day there is a pungent smell, but it isn’t going to knock you to the ground. If you happen to miss the “pink mist” hour, they will have a sampling of the flower where you can get a close sniff and experience what you missed. The reason why it smells like rotting stench is to attract pollinators so it can reproduce. It only bursts the scent once, which is truly enough for anyone in its vanity to know it is alive. To see it in full bloom you do realize how beautiful this flower really is, sadly it only stays in bloom for up to 36 hours. To accommodate this rare occasion the Gardens stay open late so everyone can witness this rare event.When you get to the Gardens during this occasion, you will notice how they have truly made this an exciting event. The staff is dressed in shirts showing the name of the Flower, in this case Sprout. They have security guards and staff along the way to assist you to the greenhouse where the flower is held. Once you approach the greenhouse, you will be handed a pin representing the flower. They have a bouncer aka staff member at the door of the green house who keeps the door closed, this will prevent the stench from escaping so you can get the full effect. Once you are in the greenhouse you will be educated with charts and explication on how the Corpse Flower comes to bloom and the history. Staff is inside to help guide you along and promote you to move closer and take pictures and enjoy the flower in full bloom. It is a wonderful experience and you learn so much in the little time you are there. My four year old has gotten into it and cannot wait until the next flower blooms. Chicago Botanical Garden has 10 more that could possibly bloom. We just do not know when. 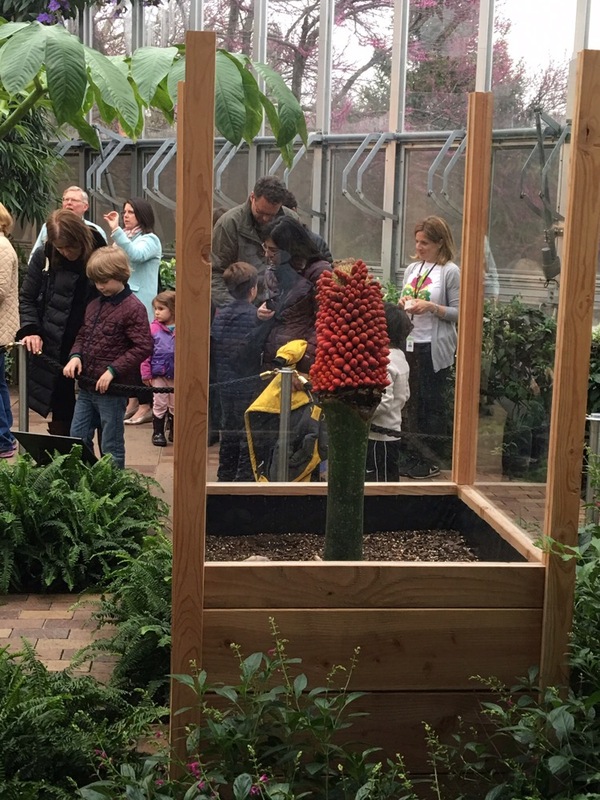 The next time you hear about the Titan Arum blooming at the Chicago Botanic Garden, try to stop and see it in person. You won’t be disappointed. Here are some fun facts from softschools.com for you to enjoy! Titan arum replaces old leaf with new one each year (usually after pause of 4 months). Titan arum produces the largest inflorescence in the world. It can reach 10 feet in height and 3 to 4 feet in diameter. Spathe looks like upturned bell. It has deeply furrowed texture and frilly margins. Spathe is green on the outside, burgundy red from the inside. Yellowish-brown upper part of the spadix (which grows above the spathe) does not contain flowers. Thousands of individual male and female flowers develop on the lower portion of the spadix which is surrounded and protected with spathe. 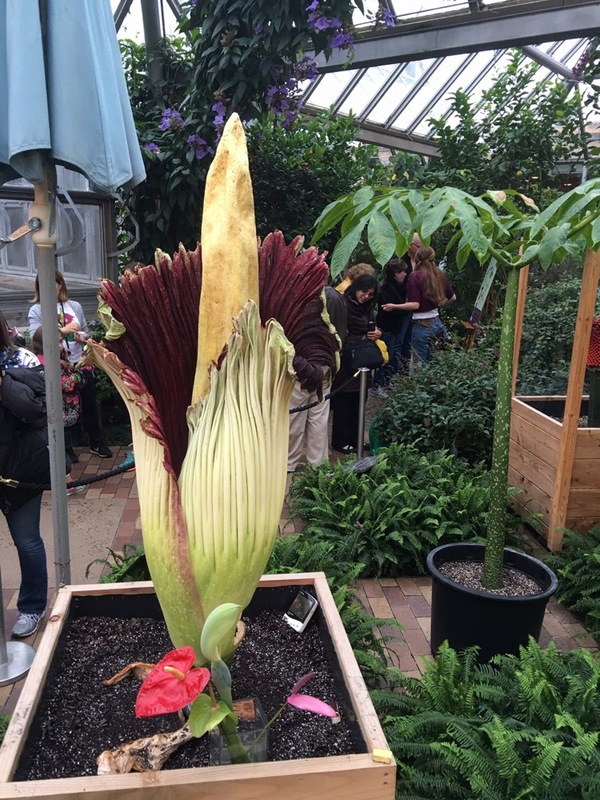 Titan arum emits pungent smell, which resembles the smell of rotting meat, to attract dung and sweat beetles and flesh flies, which are responsible for the pollination of the flowers. Plant also produces heat (via degradation of carbohydrates) to intensify the smell of the flowers. Female flowers reach maturity first. Male flowers open one or two days later to prevent self-pollination. Inflorescence lasts only 2 to 3 day due to loss of energy used for heating of the plant (tip of the spadix can reach temperature of the human body). Fruit of titan arum is bright red berry. Fruit are arranged in cylindrical clusters that can reach 19.6 inches in length.